In my previous article, I outlined the basics of how to learn React and went through a practical example. In order to keep things simple, we skipped over a few important things that I promised to revisit in this article. To get started with NPM and Webpack, first install NPM, and then create a new folder called Unfuddle_activity_2 and change into that folder. There is a great article here that takes you through all the steps to get your React project setup with Webpack and Node. Instead of repeating this article, I am going to show you what my Unfuddle application looks like after setting it up this way. Now, instead of one giant Unfuddleactivity.js file as we had in part one of the article, we are able to have a much more intuitive layout. This layout has a “app” folder where we place all our components, and each component is in its own file. Next, we have a “public” folder which is where our deployed code goes. This includes the index.html and the final “bundle.js” file which is generated by compiling the source plus the dependent node packages as shown in Figure A. 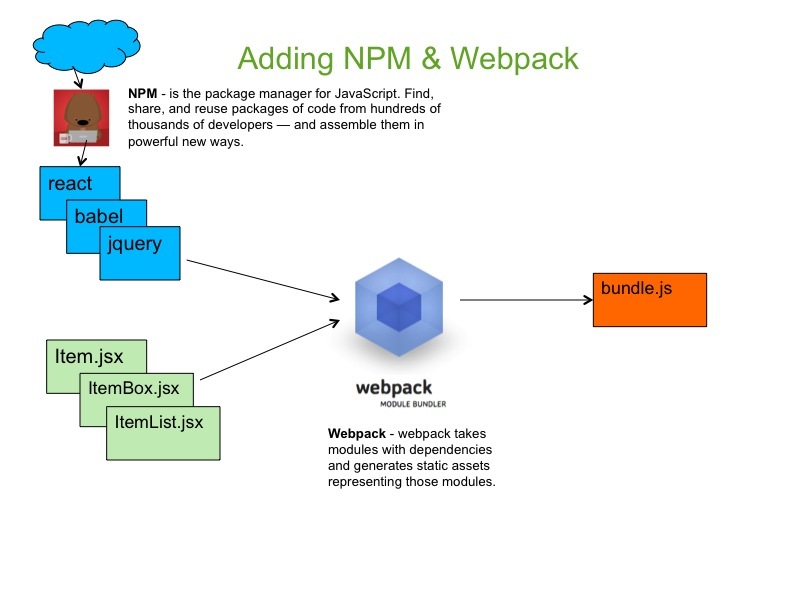 The webpack.config.js file configures how Webpack builds the bundle.js file. This is a fairly simple config. If you look at it, it just takes all the jsx files in /client/app and builds them into a bundle.js file. The unfuddle-es6.jsx file is the entry point of the app. 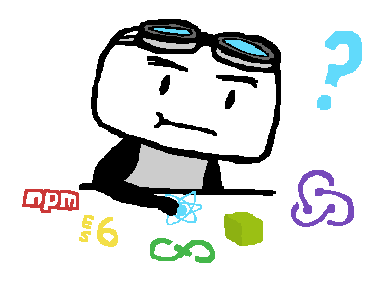 The package.json file configures how NPM is setup. For the most part, this just tells NPM which packages are needed for this app. This allows you to not have to check all your NPM packages into production and when other people pull your application they can just do a “NPM install” to get all the packages. The .babelrc file controls the jsx transpiling to js using the bable compiler. In this case, we just tell it to use the ES6 (es2015) and jsx (React) plugins. ..... // I have omitted the implementation so we can focus on the component changes. Looking at our ItemBox.jsx file, there are 2 key changes. First, we need to import or require our dependencies. On line 1-4, we import our other components we need to use and on line 5, we require JQuery which is an external NPM package we need. Lastly, at the end of the file, we need to export our component as “ItemBox,” so other components can use it. This concludes the section on setting up NPM for use with React.js. You can view the full source of my converted project here on github. This looks much more like most OO languages I have used for the past 20 years, C++, Java, Smalltalk & Ruby. My second favorite thing so far is the Arrow Functions. Not because I like the look of them (they still look confusing to me), but because they propagate “this” how you would think it works. Lets take a look at an example. With the Arrow functions, “this” behaves how we think it should. // Some items have various extra data, this is to grab this data by item type. // Could probably be a case statement. // Component to show an activity item returned from unfuddle. For me, this is a much cleaner traditional OO look! Now that we have NPM, this is easy. We just install moment using – “NPM install moment –save”. This will update our package.json file and install moment in our local node_modules folder. In our last section, we investigated how we would use a Flux implementation to better organize how we get data from an API and to our React.js components. For this section, we are going to focus on Redux which is one Flux implementation. There are others out there, but we will focus on only Redux for this article. Flux is a data flow architecture designed by Facebook and Redux is an implementation of this architecture. To be clear, Flux is not the MC in MVC, but it is an alternate design pattern for getting data to and from your views. See here for a comparison of MVC and Flux. Getting your head around Redux takes some time. In this article, we are just going to introduce the concepts and the rough idea of how to move from our existing JQuery inline calls to a Flux architecture with Redux. The first concept to understand is with Redux, you put your application state (different than component state) in a big state tree. Anytime you need to get or update data, you update this application state tree. See the Redux site for more details. Getting data into the application state tree is done using Action Creator‘s which create actions, and get data and return a payload. See here for more details on Action Creators. 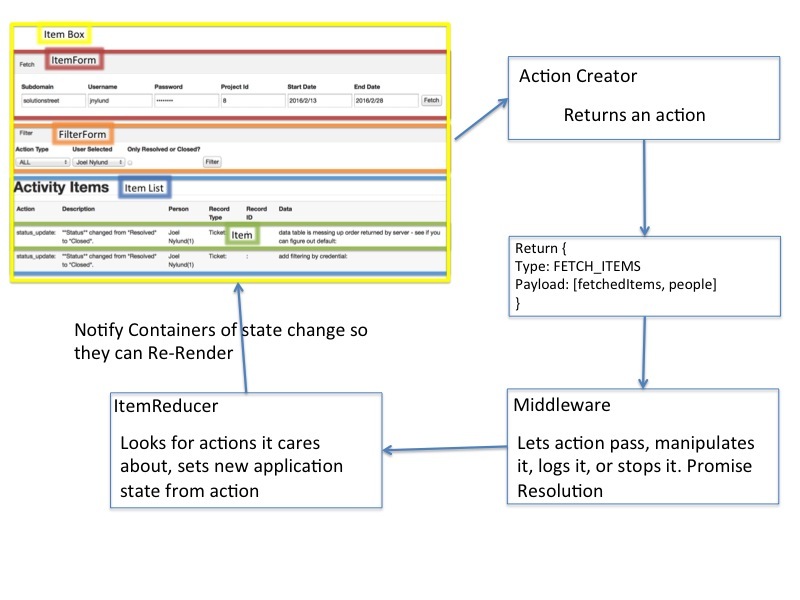 Middleware can be used to manage these actions. Getting data out of the application state tree is done using Reducers. Reducers in effect watch nodes of the application state tree and update component state accordingly. Here is what our Unfuddle Application would look like in Redux. To explain more, in Figure C, we would add a new Action Creator which would be a function to get the data from Unfuddle. This action creator would return an action with a type of “FETCH_ITEMS” and a payload of the items and the people we got back from the Unfuddle API. Remember when we did the Ajax calls we needed to use promises to get the data back. In the case of Redux, we want to return the promise from the Action Creator and let Redux middleware redux-promise resolve the promises and send back the data to the reducers. The ItemReducer would then update the application state for fetchedItems and people when they come through. Now that we have an updated application state, we need to map our application state of fetchedItems to our ItemBox’s properties called data (fetchedItems) and people. To do this mapping, Redux provides a mapStateToProps function that allows us to define this relationship. Now you have an introduction to Redux and understand the basics of Application State, Action Creator’s, Actions, Middleware and Reducers. Getting a full understanding of these concepts is beyond the scope of an article. I highly recommend the Udemy course called “Modern React with Redux”, where you can get a deep dive of how to use Redux with React.js. In this article, we learned how to add NPM to our example application and split out our React components into individual files. We also learned some ES6 basics and how to incorporate them into React.js. We simplified our date manipulation and formatting using the moment.js library. This also allowed us to see how to include other packages using NPM. Lastly, we got a high level introduction to Redux and how our application would look using Redux. I hope you found these articles helpful. Recently, I gave a presentation on these 2 articles at Devignition 2016 and you can watch the video here.